Twins Run in My Family Sweatshirt Discounts Apply ! 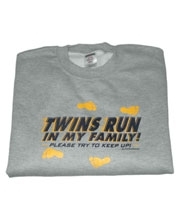 Our Twins Run in My Family sweatshirts are perfect for outdoor play groups and outings. 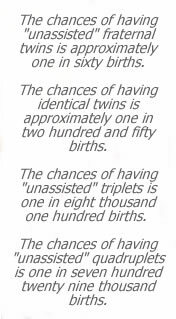 They also answer the almost inevitable "Do twins run in your family?" question with a touch of humor. Comfortable and durable, they are up to the challenge – not to mention the pace - your twins will run you through. Available in Gray.